“The Grammar of the Independent Art Scene” (Glocal perspectives on Independent cultural production)” is a comparative research study, an exhibition project with a publication and mostly a dialogue initiated between Asia Contemporary Art Platform “NON” Berlin and Berlinerpool Arts Network, with invited independent art spaces, artist residencies, art collectives and art archives from Korea and Berlin. Since May 2014 the initiators of this project share a physical space in Berlin and a common concern: join our Asian + Berliner arts networks to activate a cultural route for the exchange of projects, people, knowledge and resources. By focusing on self-organized cultural bodies from different cities, we want to facilitate a sustainable collaboration among the cultural practitioners from both places, establishing partnerships, sharing curatorial perspectives and supporting strategies for survival in the precarious ecology of the independent cultural production. ART SPACES BERLIN/SEOUL is the first episode of our comparative study and it exercises the impressions of a preliminary research with gathered material from 7 selected art spaces invited by “NON” Berlin and Berlinerpool respectively. The public event takes the form of a presentation and archival exhibition at our common facilities that will represent the 14 art spaces by means of documentation in an architectural frame designed to visualize a thread of intersections to enhance a net of interactions. We want to test a systematic “grammatic” approach towards the way in which content is curated and delivered by these organizations. How productive meaning can be created out of their content by making the invisible “visible”, evidencing rules of relationships between elements that make meaning possible, communicative and interactive”. From August 28th to September 2nd, the space of Asia Contemporary Art Platform NON Berlin will become a sentence unit depicting the many tales of the (two) cities, portraying 14 organizations, their projects and aspirations. Using this umbrella project that has been built on the cross-culture backgrounds of both cities, our deeper motivation is to “affect” the channel of inter-exchange between nations, with the further plan to carry forward an international symposium for a sustained and rapid exchange of Project Spaces in Seoul 2015. Knowledge, impressions and content generated by this encounters will be used as research material for a future publication: The Grammar of the Independent Art Scene. Glocal perspectives on Independent Cultural Production. This publication is coordinated by berlinerpool and NON Berlin. Project partners: Nonprofit Art Spaces Network, Korea. 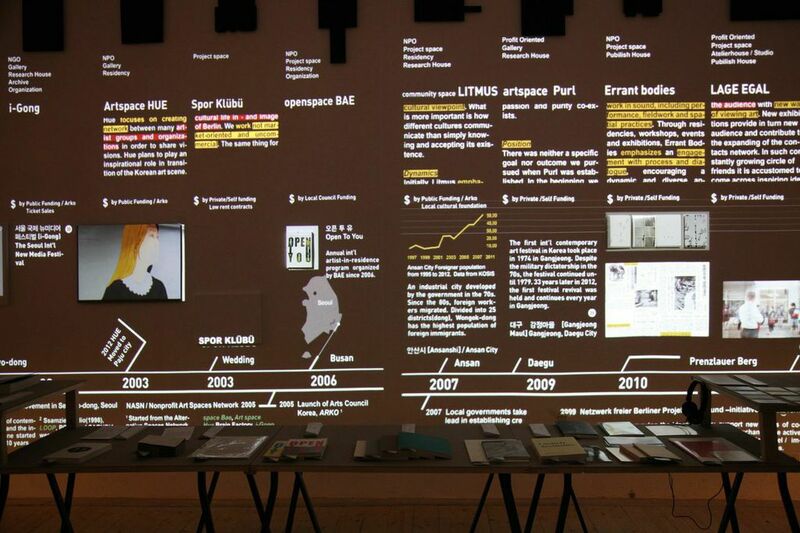 Media partners: Goethe Institut Berlin, Bezirksamt Mitte von Berlin, Netzwerk freier Berliner Projekträume und Initiativen, Trans Artists, Mondaynews (Berlin) | Nonprofit Art Spaces Network, Korea. This exhibition proposes the use of notions derived from grammatical analysis as an interpretative tool to read the operational and conceptual complexity surpassing independent cultural production. Grammar here signifying the “rules of relationship between elements that make meaning possible, communicative and interactive”. For the first chapter of our research, we equated the behaviour of independent clauses in the formation of grammatical sentences with the dynamics of 7 selected independent art spaces from Berlin and Korea. We broke down a sentence structure taking the 14 spaces as subjects or nouns of the phrase (NP = the do-ers, the agents), and we analysed their motivations, missions, visions and programs as logic semantic units formulating a complete verbal predicate (VP). We started this project by wondering about what moves them? Where do they lay an emphasis on? For whom are the actions (of this verb) performed? How do they do it? Soon we established syntactic parallels for each of those questions, enclosing their answers under metaphoric shapes of Verbs (V), Direct Objects (DO), Indirect Objects (IO) and Object Complements (OC), branching from that initial verbal predicate (VP). We couldn’t ignore the importance of the manner in which they strived for survival, how did they manage their resources and what it meant in terms of identity to subordinate those resources in a complex net of interdependencies embedded in the contexts where they operate. We disclosed those topics in the form of adverbial clauses (Advs), circumstances given in their respective geographical/financial/generational environments that modified or conditioned their original goals to some extent. By looking at their projects, we noticed an initial phase of self determination — deeply rooted in their clear visions of what alternative once meant, — how they wanted to contribute to the articulation of a diverse but strong independent art scene. But progressively after the second half of the 2000s, they opened up incorporating other sentences or independent clauses, coordinating those resources in conjunction with other bodies (coord.conj), other personalities (larger) to arrive at the same goal with a higher ambitions and capacity to engage. These two angles of cooperation, adjacent (subordinations) and juxtaposed (coordinations with other networks) pretty much determined the whole way in which these organizations tried to convey their meaning, trying to make it (in both a grammatical and literal sense), “possible, communicative and interactive”. On the way, the concrete endeavours and formats realized and developed by these organizations have put together a whole vocabulary inextricably linked to the identity of the cities where they operate. A necessary dictionary for insiders that everybody should look at when trying to understand and take the pulse of their respective local art scenes.